Everybody loves Elderberry Syrup. It’s so delicious. Medicine never tasted so good. Elderberry time is bittersweet. It represents the sweetest fullness that summer has to offer while reminding us that fall is around the corner. It is the beginning of the harvest. Tomatoes ripen in my garden while the Elderberry clusters droop on their branches. The crickets begin their song when the Elderberries are ripe and the days feel just a bit shorter. After I finish with these Elderberries I will be busy with Black Walnuts, Goldenrod, Rosehips, all the roots, Burdock, Yellow Dock and more. My kids help me pick the berries. They don’t all ripen at once so we pick them on two days separated by a week. Later I will drive around the countryside outside of the city on the hunt for more berries. The rural bushes often ripen a few weeks after my southern exposure urban shrub. I pick the berries of the clusters while I chat with the pregnant mamas. My fingers are stained from the purple juice. I spend all day making syrup. My kitchen almost pulses with heat while the berries simmer. The honey pours from bucket to measuring cup to syrup pot in golden sticky ribbons. It will be late at night by the time this vat of syrup is cool and the brandy is added and the amber bottles are filled. Elderberries are a traditional remedy for coughs and colds. I have been happy to see this remedy grow in popularity over the last decade. Modern research concurs that Elderberries are anti-viral and shorted the duration and severity of symptoms in both humans and animals suffering from various types influenza. If you want to read more about the research surrounding this wonderful berry, I recommend the comprehensive, 12 page American Botanical Council’s Clinical Guide to Elderberry found on the ABC Monographs page. Elderberry preparations are safe for babies, children, elders and pregnant women. Like many wild berries, they are a bit laxative, so it’s a possibility that heavy use could cause loose stools. 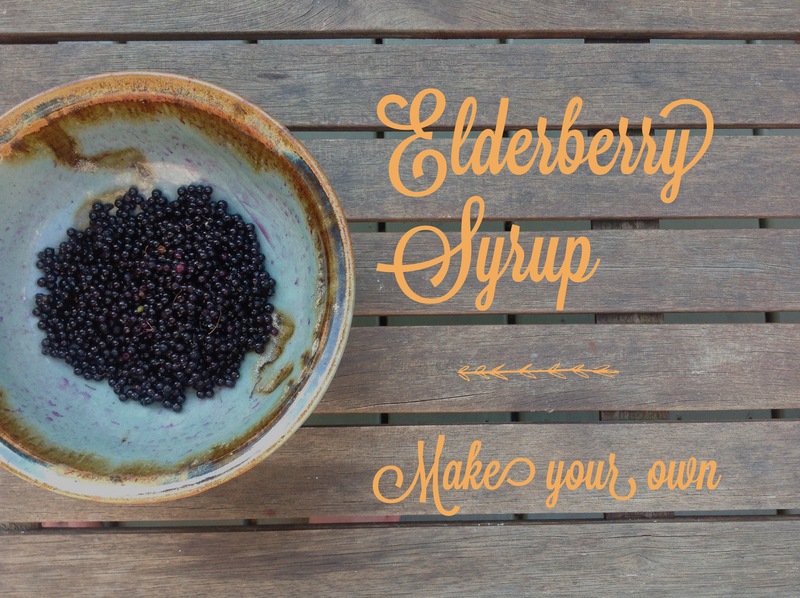 You can make your own Elderberry Syrup. It’s easy. 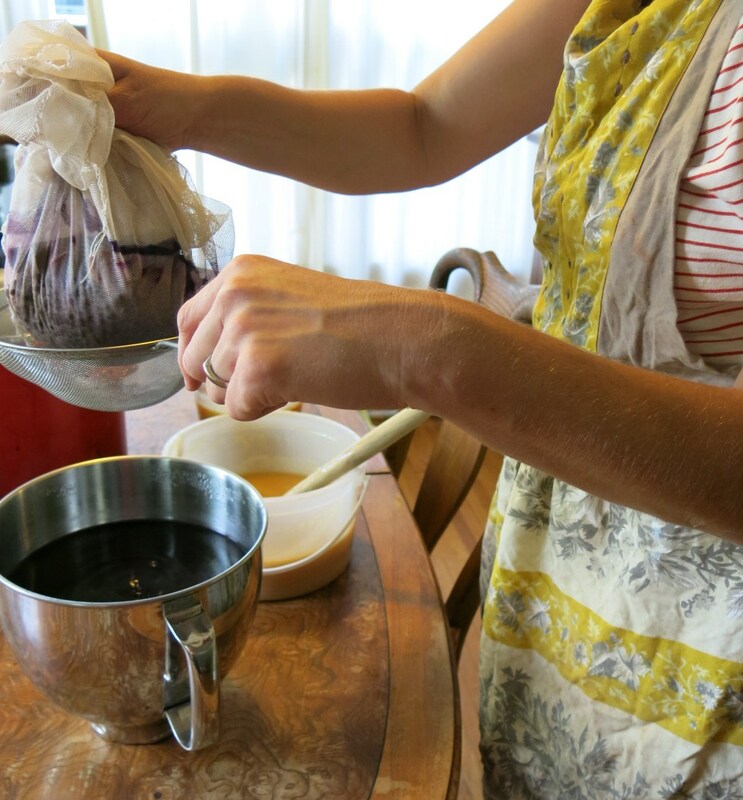 Anyone who can cook, can make Elderberry Syrup. The hardest part for most people is finding the berries. In my monograph on the Elderblossom I describe some of the botanical characteristics and habitat preferences of Elder. Take a class with a local herbalist. We all use Elder and teach about Elder. It’s a common shrub in Minnesota and Wisconsin. So here’s my recipe (annotated with my comments and tips) It’s not actually my recipe. I wish I knew who to attribute it to. I’ve been making it from the beginning of my herbal path. It bears much in common with other Elderberry Syrup recipes. You can make it with fresh or dried berries (just use half as many berries if you use dried). It’s easy to scale up. Today I made this recipe time seven and it always works perfectly. The addition of Cloves, Ginger and Cinnamon ocontribute warming, decongestant, diaphoretic properties to the syrup. Many of the delicious culinary spices and herbs are warming, circulatory stimulants that are traditionally used for the common cold, flu and other upper respiratory conditions. Contemporary commercial herbalism loves to focus on immune boosters like Echinacea, but in traditional medicine and folk herbalism people used warming circulatory stimulants to help the body throw off cold, open pores and naturally move a fever through and burn off mucus. 1 cup fresh or 1/2 cup dried black/purple Elderberries. Notes on ingredients: I prefer using the whole herbs rather than powdered. The whole herbs impart flavor and healing properties; the powdered herbs settle at the bottom of the pot or the bottle, requiring shaking before use. Strain; return liquids to the cooking pot. I like to line a fine mesh strainer with a cut piece of reusable cheese bag (pictured below) but you can also use cheesecloth or muslin. I really recommend lining the strainer. It will help catch small bits of particulate matter and it will make it easer to squeeze the solids to get some extra juice out and easier to clean up. Don’t forget to compost the solids! 5. Add the honey, bottle and refrigerate. I use raw, local, wildflower honey from Corey and Bob at Homestead Apiaries. Raw honey is a living food and it is so soothing on the throat and mucus membranes in addition to be a crucial preservative for our elderberry infusion. I cool the elderberry juice slightly and then mix in the honey and stir to combine. Then I let it sit at room temperature for a few hours until it is cooled and add some brandy. 6. Optional: Add alcohol, bottle and refrigerate. I use about 1/3 cup of brandy per batch. So for the giant batch picture above I used 2 1/3 cups brandy. Brandy is a nice choice because it is sweet and not overpowering. Make sure your bottles are clean and dry. Any kind of glass container will do, but I love the Boston Amber Rounds. They are so cool and traditional-medicine looking. Do you have to use alcohol? No, you don’t. But remember your water and elderberry infusion is like a tea. It won’t last long at room temp or even in the fridge, maybe just a few days before it molds. That’s why we add the honey. The sugar vastly improves the longevity, in addition to being delicious and soothing. But if you add a bit of brandy, it will last even longer, for months even. (If you don’t use it up before then). Store it in the back of the fridge, where it stays nice and cold. I’ve had some syrups last for well over a year. If you can get your hands on lots of berries, consider freezing some. Make a batch or two of syrup and freeze some berries to make more syrup later in the season. Frozen berries make great syrup and by making smaller batches as needed you will reduce the likelihood that your syrup will spoil or ferment. I have never had Elderberry Syrup spoil with visible mold or a foul odor. I have had it ferment once in awhile. You go to open the bottle to give some to your sick kidlet and there a popping and maybe fizzing sound and it smells a bit vinegary. It doesn’t smell bad, just strong, stronger than the original syrup. This is a wild fermentation. To tell you the truth, I don’t know if it is safe to consume this fermented syrup or not. I have, of course, on my own, with no ill effect, but I can’t authoritatively endorse it as safe for other people. Perhaps you know more about this topic than me or have more experience. You can let me know what you think in the comments and decide for yourself if you want to discard a fermented syrup or consume it. In most families you will use this syrup before it even has time to ferment. That’s it! You can make your own delicious Elderberry Syrup for the fall and winter cold, cough and flu season. Let me know if you have any questions. If you can make Elderberry Syrup, you can make any syrup. The basic technique is the same: water + herbs, simmered, + sweetener + optional alcohol = syrup. Read more about it here. If you don’t feel like making your own syrup you can buy it from me on etsy. My kids and I picked these berries with our own hands and I made this syrup on a glorious day spent at home cooking and mixing and creating. I also usually teach a workshop in the fall about cough, cold and flu season and as a group we make Elderberry Syrup for everyone to take home. Look for registration info in the coming weeks on this blog or my facebook page. Do you think it’s possible to use pure maple syrup instead of honey? While I understand that the honey itself has medicinal properties, I prefer maple syrup. You can use maple syrup instead of honey. I have used maple syrup instead of honey in the past when making elderberry syrup. This is a good choice if you are making syrup to be taken by a baby under the age of one. The general recommendation in the world of mainstream health advice is to avoid giving honey to babies. You can also use white sugar (cheap and lets the flavor of more delicate blossom syrups come through) corn syrup, molasses (extra iron and minerals) and fruit concentrates like black cherry, pomegranate, etc. Each fruit concentrate has it’s own flavor and medicinal and nutritive properties. I think this would have a minor impact on shelf life, but it’s worth noting that maple syrup has a higher water content than honey. Honey never spoils, to my knowledge, and can be left out indefinitely. I have had mold develop on a large, unrefrigerated jug of maple syrup once in the past. Therefore, maple syrup, would be less potent of preservative than honey, but I do think the effect would be minor. Would using vegetable glycerine be a good alternative for infants 6-12m? If so, what would the ratio be to elderberry juice for the recipe? Also, do you know what a standard daily dose would be for that age group? Yes, glycerin can be used instead of honey. I’ve also used maple syrup. You could also use white sugar or raw sugar, which will dissolve as you heat the mixture but add sweetness, preservative powers and thicken it a bit if you use enough. You could also use brown rice syrup. Glycerin is a great preservative. You only need about 30% of your recipe by volume to have effective preservation. For the recipe posted on my website I would use about as much glycerin as honey. I would use about 1 tsp to a 6-12 month old. But really, Elderberry Syrup is very safe and a preparation that is partly food and partly medicine, so you don’t have to be to particular about the dosing. I would repeat the dose several times a day. How much syrup does this recipe make? I usually end up with just over 3 cups. If you add the brandy at the amount I recommend(1/3 cup) the total volume is 4 1/3 cups, but the amount of syrup you will have is largely dependent on how long you simmer the syrup. The longer you simmer, the more the liquid will be reduced. Your syrup will be more concentrated but you will have less. Squeezing the berries very well will result in losing less liquid. I use a steamer juicer to juice my elderberries instead of crushing and juicing. Do you get more medicinal properties from crushing the skins or can I use the juice I get from the steamer juicer? Hi Georgia, I’ve never used a steamer juicer–I had to look up how they work. It sounds to me like it would work just fine. The skins of elderberries are quite soft. I’m sure if the juice is dark purple and tasty that this method would be just as potent. After all there are so many different ways that elderberries are prepared and consumed, fresh, frozen, dried, tinctured in alcohol, simmered in water, infused in honey….in my experience they all work great, so I’m sure steamer juiced berries will be great too. Yes the ratio or amount of elderberries per batch is the same because the frozen berries retain the water and moisture that the fresh ones have. The dried ones are more concentrated because all the liquid is gone so you use less. Hi! Could vodka also work as shelf life extender? I wonder if it has less flavor than brandy allowing elder flavor to come forward. Yes, it will definitely work to help preserve the syrup and extend the shelf life. As far as flavor goes, that’s just a matter of personal preference. The brandy is slightly sweeter. Hi I have had great success with using Elderberry in wine making, syrups, vinegar, infused brandy and shrub drinks. Should also mention the wonders of using Elder-flowers. Which can be used for all the same endeavors. The use of fermentation with this flower and berry are very fun and positive and are worth exploring. I should mention that Natura Farms on Manning Ave southwest of Forest lake area has a large planting of Elderberrys with they decided to keep and should be available for flowers and berries. Yes, the flowers are great too. Thanks for the resource about the farm with Elderberries in Forest Lake. It’s good to know there are local options for getting some Elderberries for those who can’t grow their own or wildcraft.